If you are reading this then you want to get your grocery spending down or at least under control. You want to know how to set a realistic grocery budget, one your family can enjoy without feeling deprived and missing out on things they like. There is nothing better than knowing you control your spending and a working grocery budget gives you that control. Food and groceries are the single part of your Spending Plan that you have complete and utter control over. You choose what you buy and how much you pay. You choose to either pay the advertised price or to look for a cheaper alternative. You decide how much you spend on groceries. If you don’t have a grocery budget then you don't have a plan for your grocery money. Before Disaster Struck I thought I had a grocery budget. I'd go to the bank each week (yes, I was a weekly shopper) and take out the $120 and go and spend it (it was 19 years ago!). I always spent all of it, there was never anything left and there were just two of us. I spent all of it because I thought that was my grocery budget and I had to spend it. When Disaster Struck we were a family of four, soon to be five. My grocery money more than halved to just $200 a month. Yes, that's when I switched to once-a-month shopping. And that's when I learned to maximize the money I had to do twice, sometime three times, the work. To really get your grocery budget under control you need to start at the beginning and work out exactly how much you have to spend on groceries each month or week or fortnight (or however you shop). Go back to the beginning. Track your grocery spending. When you set up a Spending Plan I advised you to track your spending so you know where your money goes. For the next month track your grocery spending. Jot down the cost of trips to the supermarket, the bottles of milk and loaves of bread you pick up during the week, the beautiful fresh eggs and fruit you buy at the local farmer's market, the extra ingredients you buy because you're trying a new recipe and those little treats you buy on impulse (Tim Tams on sale anywhere this week?). Once you have your spending you can go over it. Where did your money go? How much was spent on real food, necessary toiletries and cleaning items and how much was spent on impulse on things you didn't really need but put into the trolley anyway? Why am I suggesting you track your spending (yet again)? Because if you have no idea how much you spend you'll have no idea how much you are saving and you'll have no idea how much your grocery budget should be. This figure will give you a fair idea of just how much of your hard earned goes to groceries each month. When you have this amount, then you can start to create a working grocery budget. Actually you already have a grocery budget. If you've been spending that amount each month, you have a grocery budget by default. It may be higher than what you want, and you can work on that. But it's a starting point so write it down for the time being. This week focus on how you can maximize the money you have to spend. This is one of the biggest challenges you will face as a Cheapskate: how to eat well, keep the family happy and enjoy the foods you love on a tight budget. To find your optimal grocery budget use the amount you currently have (the figure you came up with from your tracking). On your next shop, trim that amount by 10 per cent i.e. if your grocery budget is $200, take $180 and do your shopping for that amount. If that works, then on your next shop trim another 10 per cent (take $18 off, spend $162). Continue trimming your grocery budget by 10 per cent until you find it isn't working, you can't keep your family happy on that amount and unless you increase it there will be a revolt. Up it by 10 per cent and that's your ideal grocery budget. You can learn to do this too. 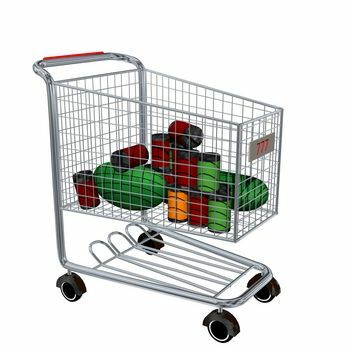 When you've recovered from the shock of seeing just how much you are really spending on groceries each month, you can get to work, trimming that budget and saving money.